The Pakistan army violated the 2003 truce agreement 513 times in the last 45 days along the Line of Control (LoC), said a senior Army officer on Saturday. “During the last about 45 days, the Pakistan army has violated the 2003 truce agreement 513 times and used heavy weaponry (artillery guns) over 100 times to target Indian forward areas and civil population,” said Lt Gen Paramjit Singh, General Officer Commanding (GOC), White Knight Corps. He said the Pakistan army rarely disclosed its fatalities while the Indian Army gave due respect to its martyrs. 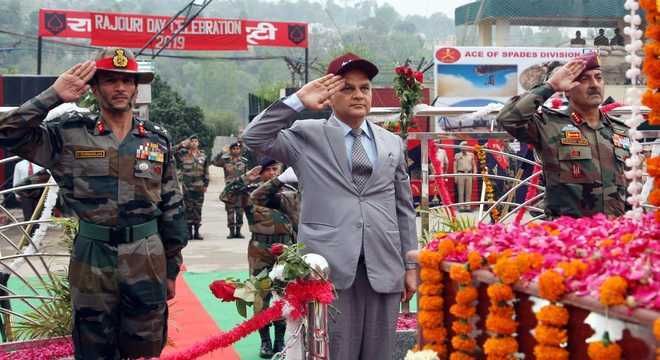 After paying homage to martyrs on the occasion of Rajouri Liberation Day, Lt Gen Paramjit Singh said, “The Army will take strong and effective action against every nefarious activity along the LoC,” the GOC said. “Whenever Pakistan uses artillery fire on the LoC, it gets the same response. People are safe till the Army is on the border,” he said. He said the Army with the help of people, security forces, civil administration had succeeded in wiping out militancy from Rajouri and Poonch. “Since the enemy (Pakistan) can revive militancy, the Army has not been withdrawn from Rajouri and Poonch districts,” said the GOC, White Knight Corps. The Army’s morale was high and it was at the highest alert along the border, the Army officer added. About the sniping incidents, the GOC said only three such cases had been reported till February 26. He also expressed his concern over the increase in militancy-related incidents in Kishtwar.